The Dubuque Telegraph Herald’s online presence (THonline.com powered by THMEDIA) began using Field59 to live stream and record prep sports on its website in August 2014, increasing its online video coverage of the Dubuque, Iowa, market. Founded in 1870, the Telegraph Herald is a daily newspaper published in Dubuque, Iowa. The newspaper is owned by Woodward Communications, Inc. and publishes its content at thonline.com. Because its location straddles two television DMAs (Cedar Rapids-Waterloo-Iowa City-Dubuque in Iowa and Madison in Wisconsin), Dubuque does not have a primary TV station of its own. In order to enhance its existing local coverage in the absence of a city-specific TV presence, the Telegraph Herald sought to add live high school sports video presentations to its website. This was the Telegraph Herald’s first season of live streaming high school sports, and the primary challenge, therefore, was to invent a high-quality production coupled with an efficient, repeatable workflow in order to attract more local sports fans to its website. Using Field59’s live streaming and video management platform in conjunction with TriCaster hardware and its existing website content management system, the Telegraph Herald was able to create, broadcast and record live high school sports for its audience. At each game, one person runs a video camera, another serves as a play-by-play announcer calling the action, and a third person handles production tasks like running commercials during stoppages of play and loading appropriate graphics into the feed. For hardware, the Telegraph Herald uses a TriCaster from Newtek, which connects to all of the computers and microphones used in the broadcast. THMEDIA staff also use the TriCaster system to pre-load commercials and graphics before each game. The TriCaster outputs the video stream, which is sent to Field59. From there, the Field59 platform ingests the stream, transcodes it to multiple formats optimized for all devices — phones, tablets or even over-the-top playback. End users access the stream through the Field59 player embedded on the live streaming section of the thonline.com website. Field59 also records the live streams and automatically publishes replays to a playlist that displays on the live streaming page when there is not a live event. 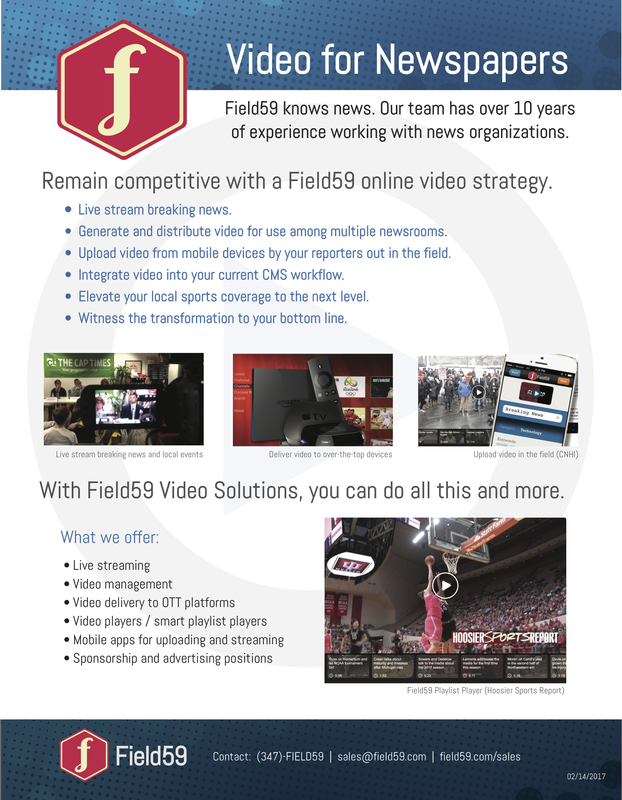 In addition, Field59 offers a video editing tool that allows the Telegraph Herald staff to edit the recordings and clip out game highlights. THMEDIA is able to monetize those recordings and clips via the ad server tags hosted in their Field59 account. The first two events streamed live on the thonline.com site netted a total of more than 1,000 views, and maintained that momentum throughout 2014. The site’s top performing streams included a late-season football game, which attracted more than 2,000 views, and a basketball doubleheader brought in just shy of 3,000 views. In addition to the events’ live audiences, replays have racked up thousands of additional views, as users are going back to the site to watch archived games after the events have taken place. THMEDIA has successfully broadcast streams of high school football, volleyball, basketball, wrestling and swimming, with each generating a significant audience. The streams have allowed THMEDIA to create more of a dedicated local presence for live high school sports, rather than relegating local residents to hearing footnotes during the sports broadcasts of television stations that share its DMA.